Wash and dry the tomatoes. 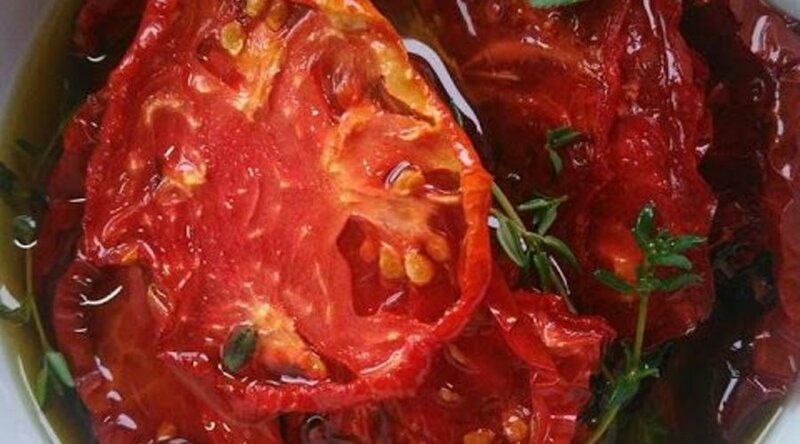 With a very sharp serrated knife, slice the tomatoes in half and season with salt. Line a couple of baking sheets with parchment paper and arrange the halves, cut side up on the sheets. Bake the tomatoes slow and low at 250 F. for 4-5 hours. Allow the tomatoes to cool completely before packing them into clean jars or containers with lids. Add herbs to the tomatoes in the containers/jars - I like to use thyme, oregano, and/or marjoram. Cover the tomatoes fully with a fresh UP EVOO of our choice, and keep covered and refrigerated for up to 3 weeks. Use the tomatoes to make dried tomato pesto, sauces, in salads, on antipasto platters, or in pastas.